Over the past two decades, endovascular embolization has become a fundamental part of a multidisciplinary approach for the treatment of intracranial arteriovenous malformations (AVMs). Several embolic agents are now an intrinsic part of the neurointerventional armamentarium. However, none has represented as remarkable an improvement as the introduction of ethylene vinyl alcohol copolymer (EVOH). In conjunction with n-butyl cyanoacrylate (NBCA), EVOH has revolutionized the endovascular management of intracranial AVMs because of its ability to systematically deliver a sufficient volume of the embolic agent to the nidus and pedicles without extension into the venous drainage. The clinical decision to treat an AVM is facilitated by preoperative risk stratification; the first question to be addressed is whether to treat the AVM; and, if so, the second question is how to treat it. Endovascular EVOH embolization is primarily applied as an adjunct treatment to microsurgical resection or radiosurgery. Few cases are amenable to angiographic cure by embolization alone. 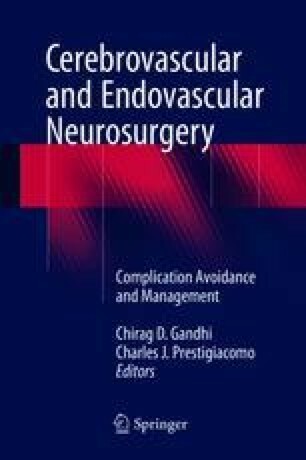 The goal of this chapter is to describe the pertinent properties, endovascular techniques, and pitfalls for the endovascular management of intracranial AVMs using EVOH. The authors thank the editorial staff of the Neuroscience Publications office of Barrow Neurological Institute for their invaluable assistance with the production of this chapter, without whom this work would not have been possible. Fifi JT. Experience with detachable tip microcatheter [online]. 2014. http://www.svin.org/files/Experiance_Fifi.pdf. Accessed Aug 2016. U.S. Food and Drug Administration. Catheter entrapment with the ev3 Onyx liquid embolic system: FDA safety communication [Online]. 2015. http://www.fda.gov/MedicalDevices/Safety/AlertsandNotices/ucm310121.htm. Archived at https://archive-it.org/collections/7993?q=Catheter+entrapment+with+the+ev3+Onyx+liquid+embolic+system&page=1&show=ArchivedPages. Accessed November 1, 2017.